Our 1-year anniversary has come and gone, but memories of the celebration we planned still linger. We’ve had talented musicians, wonderful poetry readings, a ceremony to call out the corners of our archipelago to consecrate it as holy ground, and (of course) a LOT OF DANCING! What will next year bring? Sofia kindly provided photos take at the concert area and at the fire pit where the land was sanctified. Enjoy! There is frequent discussion about the meaning of reality when one is present in a virtual world actuating an avatar which is the combined product of computer programming and art work. What IS real and what is not? I won’t be the first, the last nor the best one to tackle this subject but it needs to be addressed. What you see and manipulate in Second Life is not real. Who you interact with is always real. The person sharing an opinion is someone sitting in Hoboken or Los Angeles, typing their comments via a computer…just like you! They are not computer generated images, however unlikely their avatar’s appearance might be. Just like you, they know great joys and disappointments in their lives. Just like you, they have had a good day or a bad day. And just like you, they enter into this virtual world for their own purposes. 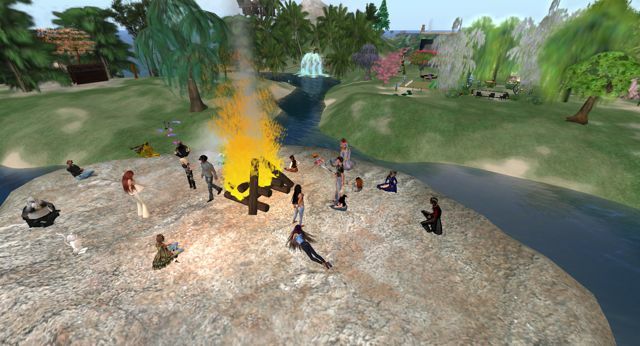 UUtopia, like the rest of Second Life, fulfills many needs. One can relax after a hard day with friends, one can meet new people, share or learn new ideas or experiences. One can create new structures, devices, clothing, or opportunities for entertainment. And in UUtopia, one can participate in weekly Unitarian Universalist services. There are limits to what an animated avatar can do to implement these principles, but there are no limits for the human sitting behind the computer monitor. 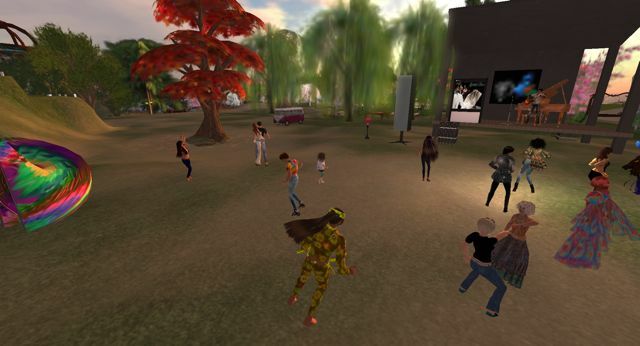 As such, the First Unitarian Universalist Congregation of Second Life has decided to exert the influence of its very human members to help other people, to show our compassion and to enable those who are willing to help themselves. We regularly exercise the second and third principals with open and energetic discussions about the human condition and about the beliefs of many different religions. Look at the avatar to your right and to your left. Close your eyes and see the college student taking a few minutes off from her mountain of text books, the father who read his children a favorite story before sending them off to bed, the retiree who just wants a bit of company and laughter. These are the people who are sharing the virtual space with you. This schedule is, by no means, complete, but wanted to make public what is already set. Wuudstock, the one year anniversary of the UUtopia region, will be March 25. We are planning a big festival to celebrate our life there as a community. 3-4 p.m. SLT– Spirited Emor will perform a mix of standards, pop, and jazz. 4-5 p.m. SLT– Geos Copperfield will present folk music. 5-6 p.m. SLT– Kitzie Lane will perform her mix of pop and rock music. 6:30 – 7 p.m. SLT– Beacon Questie will lead us in a brief celebration ritual. 7:30 p.m.- 8 p.m. SLT — NormReynolds Genesis will perform blues and rock. Please let me know if you have other performance suggestions: esp dance or drama. Stage is erected on the sim divide between the coffee shop and the games area. These articles are from the UUtopia News, edited by Beacon Questi, about UUtopia when it was on the Mainland. They were on the FUUCSL.org web site, but the make more sense being here. “Happy New Year!” That greeting will be said and heard for at least the first couple of weeks as a new year gets under way. I have to say at the outset that celebrating New Years has always boggled my mind. Why celebrate it? I can understand religious holidays. I can understand Independence Day. But why New Years? I never really saw the point of staying awake until midnight to watch other people on a TV celebrate a big ball coming down. A new year? What is so big about that? 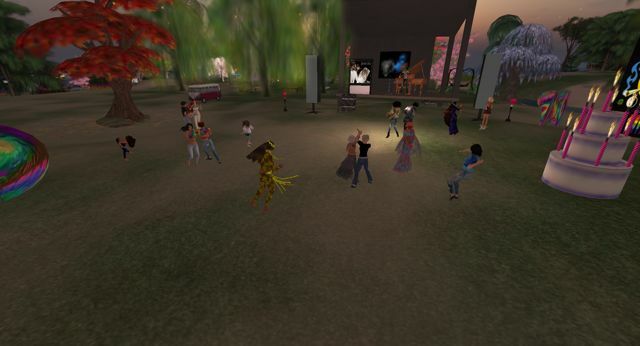 Wild Life in Second Life! •2010/12/17 • Comments Off on Wild Life in Second Life! A word needs to be said about the wildlife in UUtopia (and environs), because strange things happen here. Cinematic entrepreneur, Knarf Pizzicato, announced the Grand Opening of The Cosmopolitan Theatre, an underground treasure trove of black and white classics as well as more modern fare. 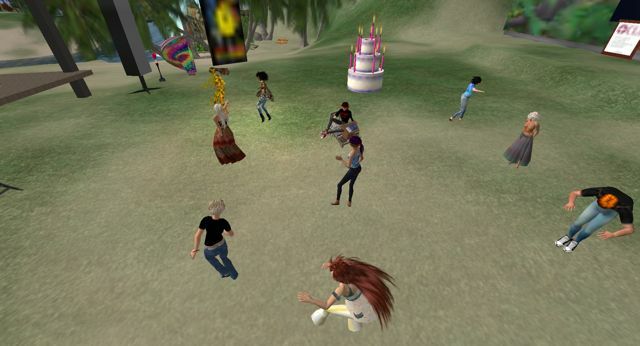 Mr. Pizzicato held his Grand Opening on October 30th, 2010, at 6 PM SLT. Present were Zyzzy Zarf, officiating, as well as Darcy Cedarbridge (Security), Joan Ixito (Reporting), Heximer Thane, Freda Frostbite and Darrell Farstrider. Contents copyright (c) 2009-2011 by the respective authors.